វិភាគទានរបស់ស.រ.ដ៏សំខាន់ចំពោះកិច្ចប្រឹងប្រែងរបស់ក.ជ.ខ.បានប្រែមកជាទម្រង់យន្តហោះទម្លាក់គ្រាប់បែក និងយន្តអាកាសកលយុទ្ធនៃកងអាកាសស.រ. ។ នៅពេលនោះលោកប្រធានាធិបតីនិច្សុនបានផ្ដើមការលុកលុយនៅឆ្នាំ១៩៧០ កងទ័ពអាមេរិកនិងវៀតណាមខាងត្បូងបានប្រតិបត្តិការក្រោមឆ័ត្រ​នៃការគ្របដណ្ដប់អាកាសដែលត្រូវបានកំណត់ឡើងប្រតិបត្តិការ ចែកចាយសេរី ។ នៅពេលនោះកងទ័ពទាំងនោះត្រូវបានដកចេញ ប្រតិបត្តិការអាកាសបានបន្ត ដោយសំញ៉ែងហាមឃាត់ចលនានិងដឹកនាំសាស្ត្រកងទ័ពក.ប.វ.ណ./រ.រ.ជ. ។ ដោយពិតទៅ (ហើយនិងមិនបានដឹងដល់សមាជនិងសាធារណជនអាមេរិកទេ), ពួកគេត្រូវប្រើប្រាស់ដើម្បីផ្ដល់ជំនួយអាកាសខាងកលយុទ្ធដល់ក.ជ.ខ. ។ តាមអតីតនាយទាហានស.រ.ម្នាក់នៅភ្នំពេញបានរាយការណ៍ តំបន់ក្បែរទន្លេមេគង្គគឺពោរពេញដោយរណ្ដៅគ្រាប់បែកមកតែ ពីការវាយប្រហាររបស់ប-៥២នោះ នៅឆ្នាំ១៩៧៣ រណ្ដៅទាំងនោះមើលទៅដូចជាជ្រលងនានានៃស្ថានព្រះចន្ទ ។"
ភាពមេដឹកនាំខ្មែរក្រហមគឺស្ទើរតែមិនបានដឹងទាំងស្រុងដោយសាធារណជនឡើយ ។ ពួកគេសំដៅដោយពួកជនរួមជាតិសមមិត្តរបស់ពួកថាជា ទ័ពព្រៃ ។ ពីមុន ការមានពិតនៃបក្សកុម្មុយនិស្តគឺជាធាតុមួយនៃរ.រ.រ.ជ.ក.ដែលត្រូវបានគេលាក់កំបាំង ។ នៅខាងក្នុង តំបន់រំដោះនានា គឺជាធម្មតាសំដៅលើអង្គការ ។ កំឡុងឆ្នាំ១៩៧៣ បក្សកុម្មុយនិស្តបានធ្លាក់ក្រោមការគ្រប់គ្រងនៃពួកសមាជិក​ដែលនិយមជ្រុលបំផុតរបស់ខ្លួន គឺ ប៉ុល-ពត និងស៊ុន-សេន ដែលជឿថា កម្ពុជាគឺត្រូវដើរទៅតាមរយៈបដិវត្តន៍សង្គមទាំងស្រុង​និងថាគ្រប់យ៉ាងដែលបានដំណើរការទៅមុខវាគឺជាការប្រទេចផ្ដាសា​ហើយត្រូវតែកម្ទេចចោល ។"
"រូបថតនៃពួកសាធារណរដ្ឋខ្មែរដែលបានចូលមក​ដើម្បីរំលឹកដល់ពេលនោះ គឺជាម្នាក់ក្នុងចំណោមបុរសឈឺ​ដែលនៅរស់តែម្នាក់គត់​ដោយមធ្យោបាយខាងក្រៅនានា ហើយថា ក្នុងលក្ខ័ណ្ឌខ្លួន ការត្រួតពិនិត្យការប្រើប្រាស់ឱសថ ប្រសិទ្ធិភាពយ៉ាងណាៗវាអាចទៅរួច គឺប្រហែលជាគ្មានតម្លៃថែមទៀតទេ ។"
↑ Marek Sliwinski, Le Génocide Khmer Rouge: Une Analyse Démographique (L’Harmattan, 1995). ↑ The Economist, February 26, 1983. ↑ Washington Post, April 23, 1985. ↑ Dmitry Mosyakov, “The Khmer Rouge and the Vietnamese Communists: A History of Their Relations as Told in the Soviet Archives,” in Susan E. Cook, ed., Genocide in Cambodia and Rwanda (Yale Genocide Studies Program Monograph Series No. 1, 2004), p54ff. 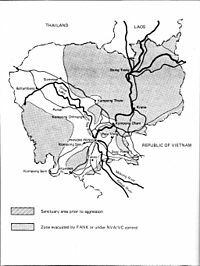 Available online at: http://128.36.236.77/workpaper/pdfs/GS20.pdf "In April–May 1970, many North Vietnamese forces entered Cambodia in response to the call for help addressed to Vietnam not by Pol Pot, but by his deputy Nuon Chea. Nguyen Co Thach recalls: “Nuon Chea has asked for help and we have liberated five provinces of Cambodia in ten days.”"
↑ Isaacs, Hardy and Brown et al., pp. 54–58. ↑ ១០,០ ១០,១ Isaacs, Hardy and Brown, p. 83. ↑ ១១,០ ១១,១ Lipsman and Doyle, p. 127. ↑ Victory in Vietnam, p. 465, fn. 24. ↑ Isaacs, Hardy and Brown, p. 85. ↑ Beginning in 1966, Cambodians sold 100,000 tons of Cambodian rice to PAVN, who offered the world price and paid in U.S. dollars. The government paid only a low fixed price and thereby lost the taxes and profits that would have been gained. The drop in rice for export (from 583,700 tons in 1965 to 199,049 tons in 1966) elevated an economic crises that grew worse with each passing year. Isaacs, Hardy and Brown, p. 85. ↑ ១៨,០ ១៨,១ Isaacs, Hardy and Brown, p. 86. ↑ ២១,០ ២១,១ Lipsman and Doyle, p. 130. ↑ ២៣,០ ២៣,១ Chandler, p. 166. ↑ Isaacs, Hardy and Brown, p. 87. ↑ ២៨,០ ២៨,១ Sutsakhan, p. 32. ↑ Isaacs, Hardy and Brown, p. 89. ↑ ៣១,០ ៣១,១ ៣១,២ Isaacs, Hardy and Brown, p. 90. ↑ Lipsman and Doyle, p. 140. ↑ Isaacs, Hardy and Brown, p. 88. ↑ Military Assistance Command, Vietnam, Command History 1967, Annex F, Saigon, 1968, p. 4. ↑ Lipsman and Doyle, p. 142. ↑ Lipsman and Doyle, p. 143. ↑ ៤៤,០ ៤៤,១ ៤៤,២ ៤៤,៣ ៤៤,៤ ៤៤,៥ Lipsman and Doyle, p. 144. ↑ Lipsman and Doyle, p. 145. ↑ Lipsman and Doyle, p. 146. ↑ Osborne, pp. 214, 218. ↑ Lipsman and Brown, p. 146. ↑ Shawcross, pp. 169, 191. ↑ ៦៣,០ ៦៣,១ Isaacs, Hardy and Brown, p. 108. ↑ General Abrams dispatched General Conroy to Phnom Penh to observe the situation and report back. Conroy's conclusions were that the Cambodian officer corps "had no combat experience...did not know how to run an army nor were they seemingly concerned about their ignorance in the face of the mortal threats that they faced." Shaw, p. 137. ↑ ៦៧,០ ៦៧,១ Sutsakhan, p. 89. ↑ In a post-war survey of U.S. infantry officers that had served in the Vietnam Conflict, 44 percent rated PAVN as "skilled and tough fighters". One officer commented "There was a tendency to underestimate the enemy. They were, in fact, the best enemy we have faced in our history." Kinnard, p. 67. ↑ The evolution of the communist forces is described in Sutsakhan, pp. 78–82. ↑ ៧១,០ ៧១,១ Karnow, p. 608. ↑ Deac, p. 72. 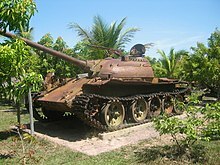 PAVN units involved included the 1st, 5th, 7th, and 9th Divisions and the PAVN/NLF C40 Division. Artillery support was provided by the 69th Artillery Division. ↑ Douglas Pike, John Prados, James W. Gibson, Shelby Stanton, Col. Rod Paschall, John Morrocco, and Benjamin F. Schemmer, War in the Shadows. Boston: Boston Publishing Company, 1988, p. 146. ↑ War in the Shadows, p. 149. ↑ Isaacs, Hardy and Brown, p. 100. ↑ ៨៥,០ ៨៥,១ Isaacs, Hardy and Brown, p. 106. ↑ ៨៦,០ ៨៦,១ Isaacs, Hardy and Brown, pp. 106–107. ↑ ៨៩,០ ៨៩,១ ៨៩,២ ៨៩,៣ ៨៩,៤ Isaacs, Hardy and Brown, p. 107. ↑ Ideology was not all that separated the two communist groups. 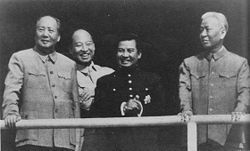 Many Cambodian communists shared racially-based views about the Vietnamese with their fellow countrymen. Deac, pp. 216, 230. ↑ Lipsman and Weiss, p. 119. ↑ The Republic's five-year war cost the U.S. about a million dollars a day – a total of $1.8 billion in military and economic aid. Operation Freedom Deal added another $7 billion. Deac, p. 221. ↑ Isaacs, Hardy and Brown, p. 111. Sutsakhan, Lt. Gen. Sak, The Khmer Republic at War and the Final Collapse. Washington DC: មជ្ឈមណ្ឌលប្រវត្តិសាស្ត្រកងទ័ពសហរដ្ឋ, 1987. Kinnard, Douglas, The War Managers. Wayne NJ: Avery Publishing Group, 1988. Pike Douglas, John Prados, James W. Gibson, Shelby Stanton, Col. Rod Paschall, John Morrocco, and Benjamin F. Schemmer, War in the Shadows. Boston: Boston Publishing Company, 1991. Ponchaud, Francois, Cambodia: Year Zero. New York: Holt, Rinehart, and Winston, 1981.